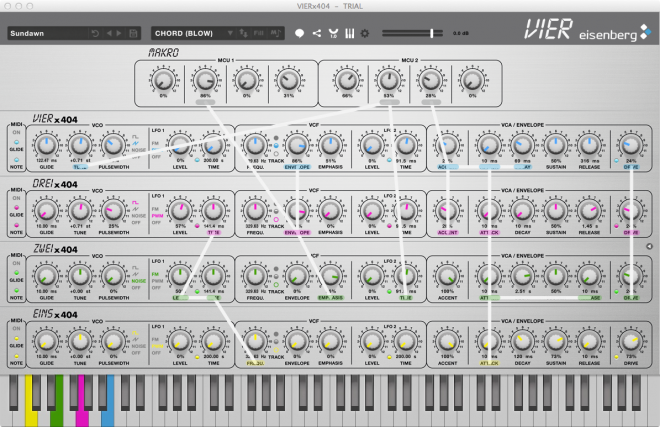 Discover Eisenberg's new four unit software synthesizer. Learn about the story behind the development of VIER. 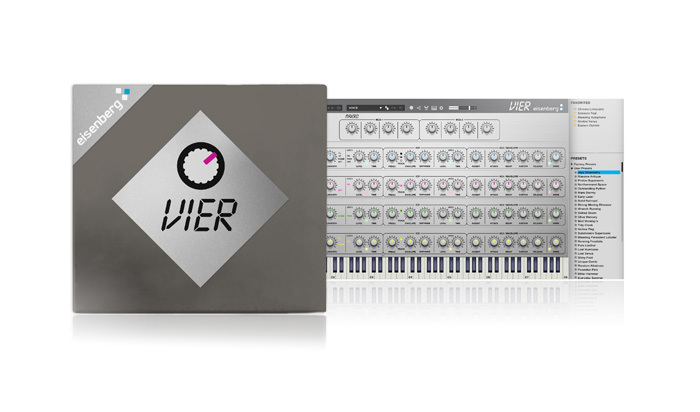 VIER emulates four units of the Doepfer MS-404, a famous German monophonic analogue synthesizer from the nineties. Even today the MS-404 has a large fan base and is not only known to insiders. Since the original MS-404 was monophonic, being able to play four units polyphonic at the same time, VIER fulfills a childhood dream for many musicians. 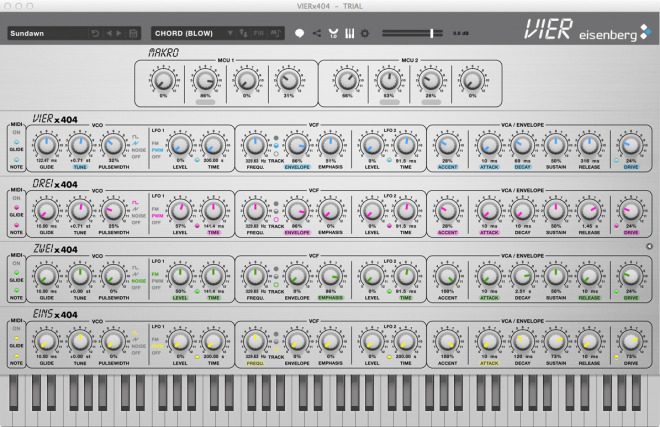 The software uses up-to-date technologies for its synthesis engine like anti-aliasing oscillators which are capable of audio range modulation and zero delay feedback filters best known from synthesizers like LuSH, Monark or Diva. VIER offers a wide range of options for parameter linking and cross modulation. All parameters may freely be grouped and linked with each other. An intelligent voice management dynamically assigns pressed keys and played notes to the different units. Both features enable sound opportunities that go far beyond the plain emulation of a vintage synthesizer or just the sum of four parts. The parameter linking allows building groups which can be manipulated and modulated by macro parameters together. This offers a fast access to the most important sound properties and allows operating the four units as one monolithic piece. The intelligent voice management offers different creative play modes which especially allow an automatic assignment of each note in a chord to the four different units. Each of the units themselves can of course be operated with unlimited polyphony. VIER contains a broad variety of factory presets that may be loaded, adjusted and saved or marked as favorites. Furthermore, the user may create, save and load own presets. 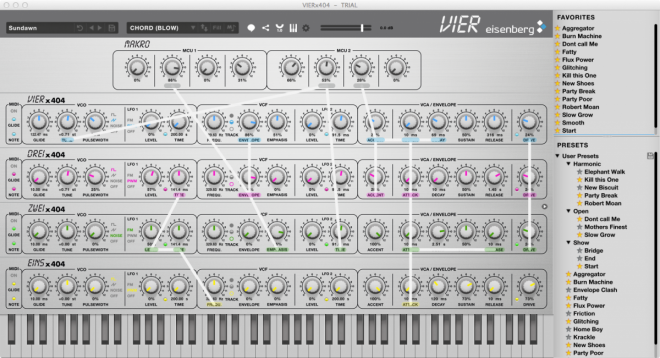 VIER runs stand-alone on Windows and Mac OS X or as plugin via VST, AU, RTAS and AAX. A trial version is ready for download here.